Nubra Valley : From Leh, highway runs north over the awesome Khardung La, the hightestmotorable pass in the world. Beyond the pass is the wide, flat Nubra Valley, criscrossed by the winding channels of the Shayok&Nubra (Siachan) rivers. Local scholars say that its original name was Ldumra( the valley of flowers). 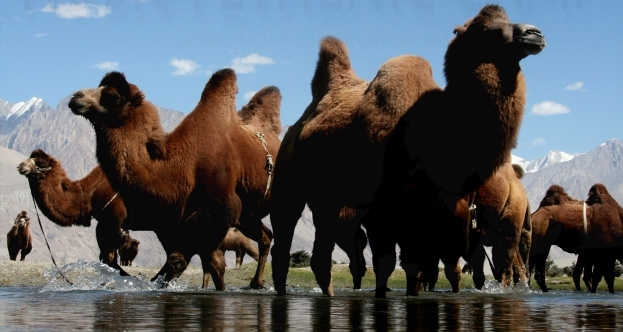 There are Shaggy Bactrian (two - humped) camels in the sand dunes of the Nubra Valley. Dotted around the valley are ancient gompas and awesome villages which makes this magnificent trip. After breakfast at the hotel, drive with packed Lunch to visit Stok Royal Palace. After Stok then drive towards Ladakh biggest and richest Hemis monastery. On way back visit Thiksey monastery and Shey Palace. Overnight at hotel. Morning, after breakfast, drive back to Leh along the same road. ArriveLeh by afternoon. Post Lunch free to explore Leh. Overnight in Leh. Hotel/ Fix Camp in Nubra.